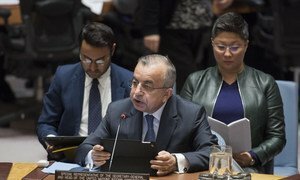 Zahir Tanin, Special Representative of the Secretary-General and Head of the United Nations Interim Administration Mission in Kosovo (UNMIK), briefs the Security Council. Efforts to calm tensions between Belgrade and Pristina that came to a head with the arrest, “theatrical” parade and expulsion of a lead negotiator from Kosovo, must be redoubled if “real progress” is to be made on the ground, a senior United Nations official said on Monday. “There is no other viable option. However, for that to happen there is a clear need for exercising leadership, to stand up to challenges” even if there are “short-term political costs,” said Zahir Tanin, the head of the UN Interim Administration Mission in Kosovo (UNMIK), addressing the Security Council on Monday. “A new focus by Brussels [the European Union] at all levels provides a mutually beneficial opportunity for Pristina and Belgrade to leave the current difficult moment behind and to take the dialogue to the next stage of real progress,” he added. In his quarterly briefing to the 15-member Council on the situation in Kosovo and the work of the UN Mission, Mr. Tanin said that UNMIK continues to focus on creating an atmosphere which allows for compromise in good-faith. “Our efforts are aimed at sustaining peace, ensuring we remain at the forefront of monitoring and analysing the situation and reinforcing strategic coordination with members of all UN entities, as well as international partners” alongside the authorities in Kosovo, he said. He described the recent Kosovo Trust-Building Forum, which brought together UNMIK, the European Union Rule of Law Mission, the Organisation for Security and Co-operation in Europe (OSCE) and more than 100 community leaders, to discuss ways of building a positive path for the future. “Multiple focus groups worked to strengthen understanding across community divides. The resulting outcomes identified by participants provided a roadmap for objectives to be implemented in Kosovo,” recalled Mr. Tanin of the Forum, urging all leaders in Kosovo to move forward with more trust, compassion, understanding, and clarity. Turning to Kosovo’s relations with the rest of Europe, Mr. Tanin, who is also the Special Representative of the UN Secretary-General for Kosovo, said a number of steps must be taken, including a security agreement with Montenegro and strengthening the rule of law and human rights portfolios. In that vein, he noted the approval of a new draft of the Kosovo criminal code, introducing stricter penalties for offences related to corruption and misuse of official duty. Concerning the protection of cultural heritage, he described progress in the so-called “special protected zones” and said the world was watching how the Government was handling construction near the Visoki Dečani Monastery, a UNESCO World Heritage Site, in western Kosovo. Noting recent momentum to advance democracy and good governance in Kosovo, the head of the United Nations Mission there urged for more emphasis on rebuilding trust and reconciliation, including through engagement with women and the youth, as well as on overcoming challenges related to freedom of cultural and religious identity.